Gentle reader, I was not made to drive a car. With absolutely no sense of direction and not much more coordination, I am an unwilling driver and a happy backseat passenger. I did pass my driving test. It took me seven attempts and several changes of driving instructor. Oh, did I mention that patience is a virtue I really don’t possess? We set off from Belfast Airport on a schedule that looked reasonable. 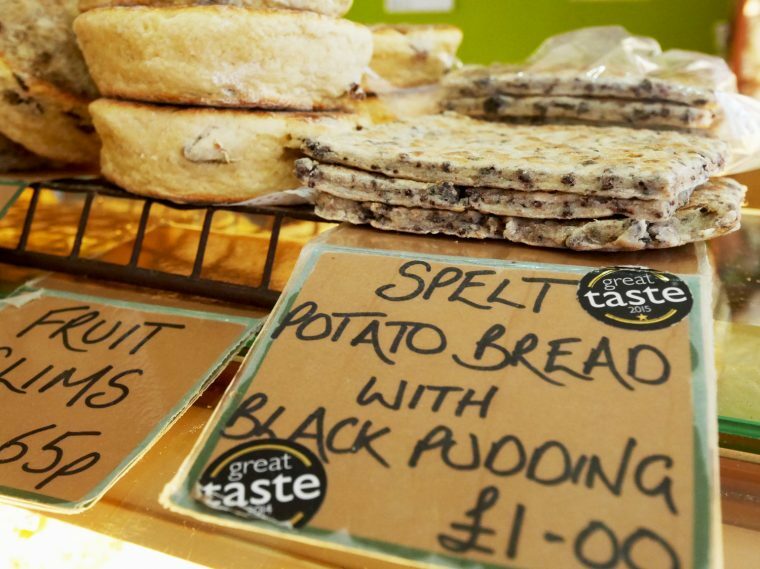 Perhaps we spent too long drinking tea and eating award winning spelt and black pudding potato bread at Ann’s Pantry – our first stop, in Larne. 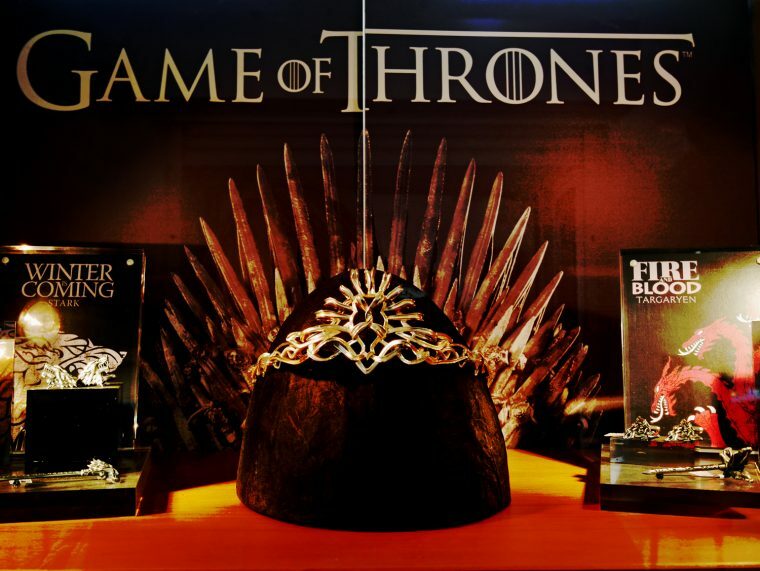 Or, trying on the Game of Thrones Jewellery at Steensons in Glenarm Village. 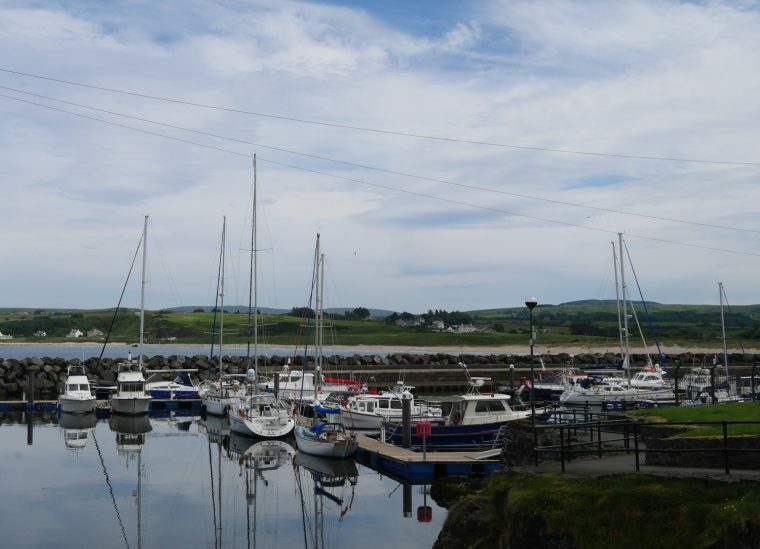 We definitely didn’t anticipate a three-hour walking tour of Ballycastle – but neither of us objected to being fed on a whole range of Irish dishes. 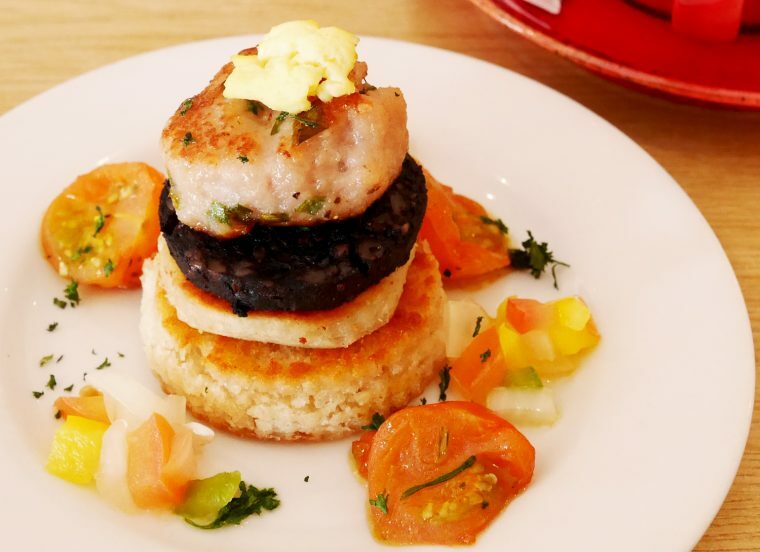 The Ballycastle food tour is unusual in that despite being set in a town with a population of around 5,000 there’s enough to see and far more than enough to eat to keep you busy. Perhaps that’s why Ballycastle was voted the best place to live in Northern Ireland by the Sunday Times. 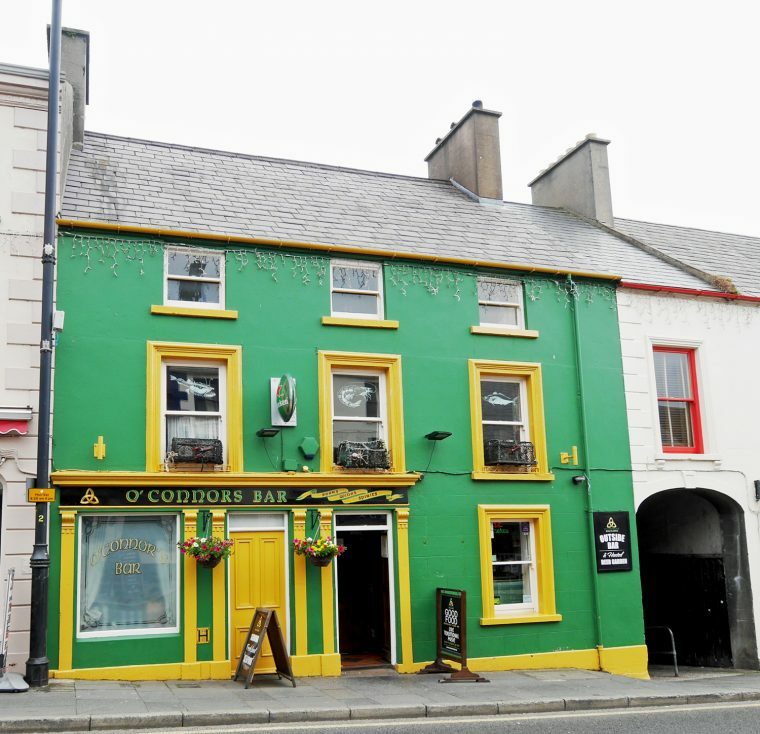 the friendly pub O’Connors, where we ate a stunning seafood chowder and the Central Wine Bar where we feasted on freshly picked crab claws. 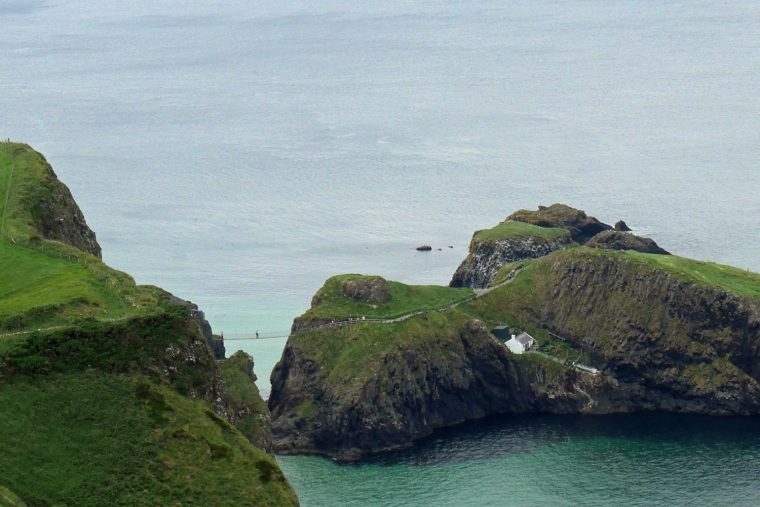 But, it probably wasn’t until we left, about 2 hours later than planned, and made our way to the carpark to take a look at the Carrick a Rede Rope Bridge that I began to really appreciate the stunning countryside of Northern Ireland. We were running behind schedule so didn’t try to walk across the bridge – something I was secretly quite grateful for. 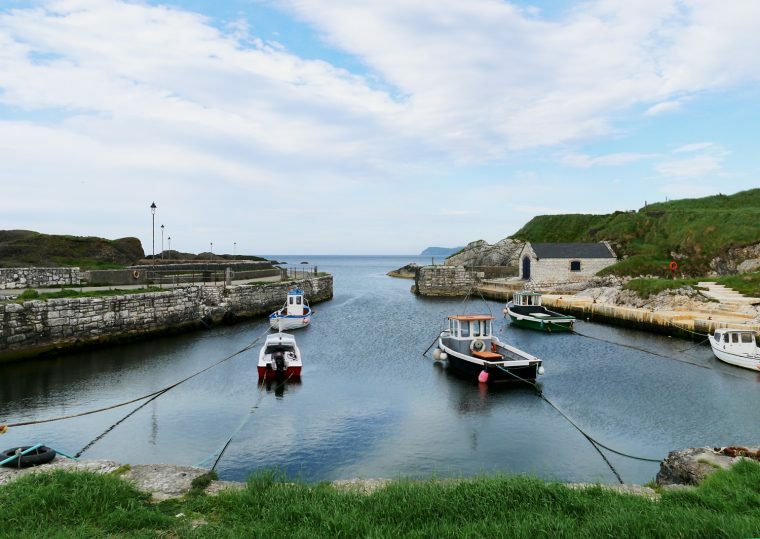 A few miles along the road is the charming Ballintoy Village and Harbour. It’s one of the landmark sites for anyone looking for Game of Thrones filming locations and arriving as we did as the sun was setting, it was easy to see why. Shimmering, silvery evening light glancing across the water, this is where Theon Grey joy returns to the Iron Islands and meets his sister Yara in the Game of Thrones. We stayed far too long, watching the seabirds and just gazing out over the water. 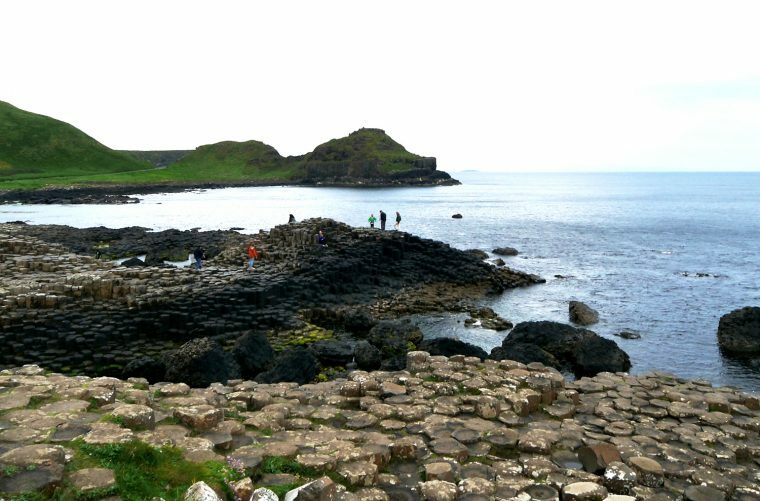 Surprisingly, the Giant’s Causeway isn’t a Game of Thrones location. But, it’s been on my own wish list for a while and I was thrilled to finally get there. Walk down a moderately steep hill towards the sea and you find a surreal set of basalt rocks. Like giant stepping stones, they make the perfect playground. 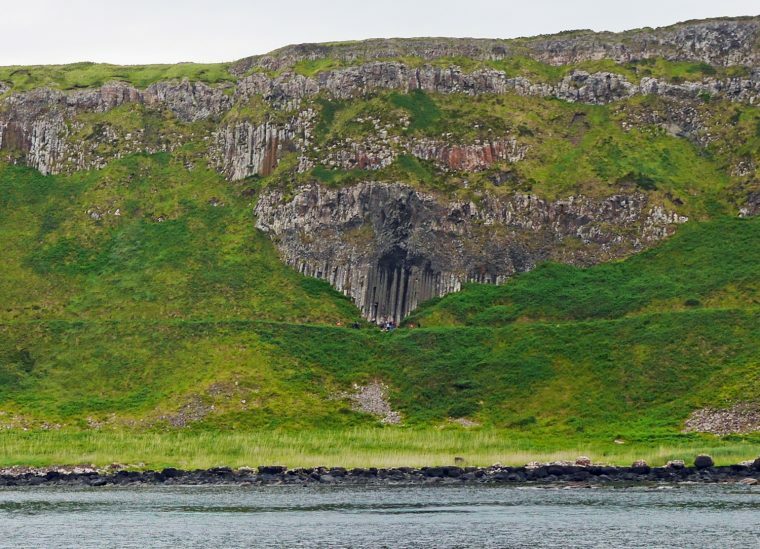 Formed when molten lava hit the sea, there are more strange rock clusters including the Harp, the Organ, the Camel and the Wishing Chair. 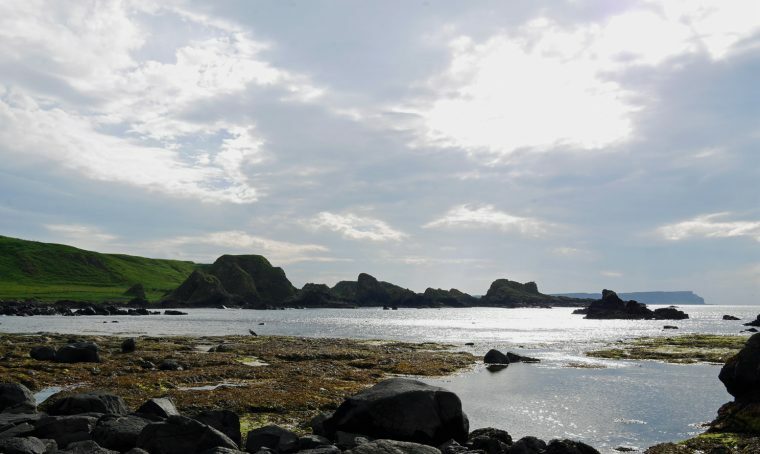 Of course, legend tells a different tale – the Irish giant Fin McCool or Fionn mac Cumhaill was being threatened by Benandonner, a giant from Scotland. 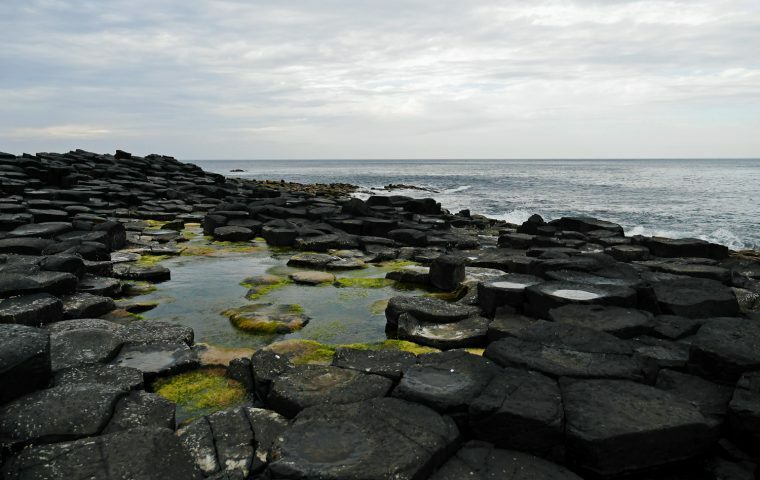 To fight him off, Finn tears chunks of rock from the Antrim coast and throws them into the sea – creating a path that Finn uses to make his way to Scotland. However, Benandonner turns out to be terrifying and Finn runs back to Ireland, where his wife disguises him as a baby and manages to fool Benandonner into believing that his foe must be massive if his child is already a giant! If the Giant’s Causeway is the most photographed landscape in Northern Ireland, the Dark Hedges must come a close second now. 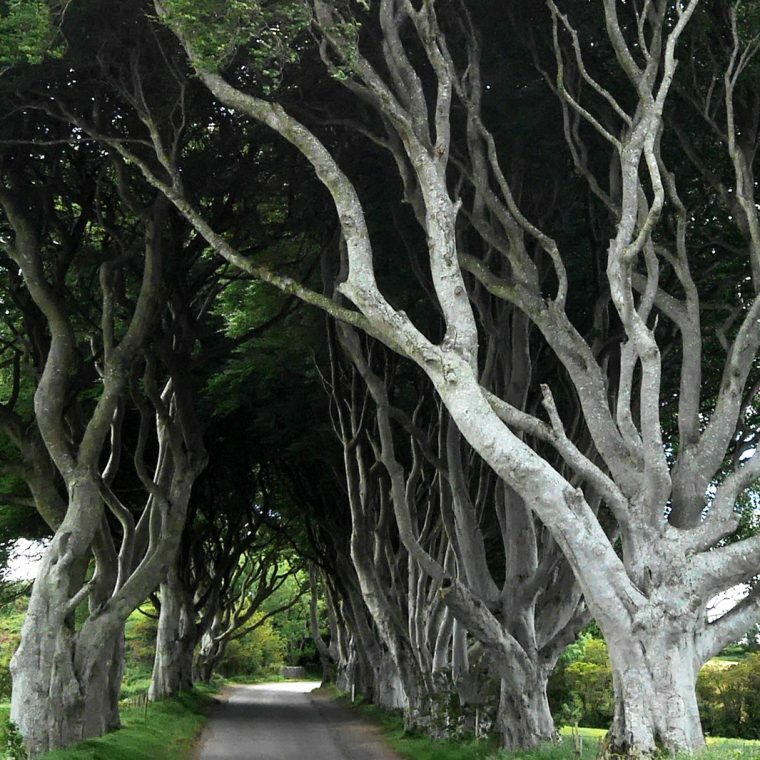 The avenue of beech hedges are a natural phenomenon, planted originally by the Stuart family in the 18th century to line the approach to their Georgian mansion, Gracehill House. 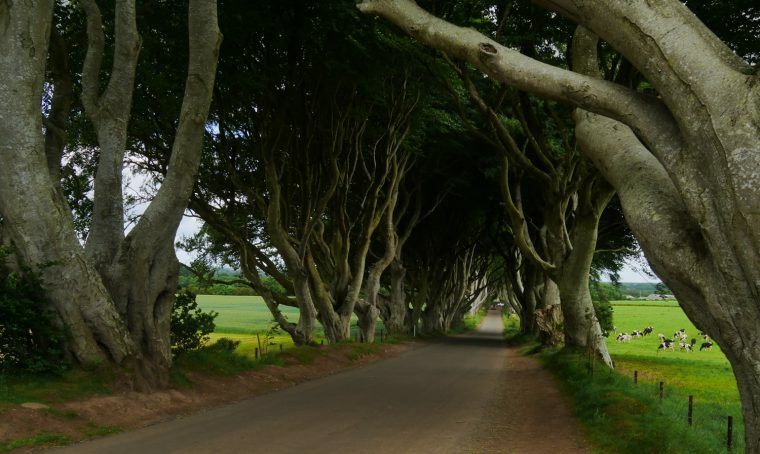 Over the centuries, the hedges have grown and knotted together so now they form a covered avenue that makes the perfect regal setting for the King’s Road in the Game of Thrones. I’d recommend arriving early in the morning if possible as the avenue can get very busy. We may just have won out because the weather was a little patchy. But, there’s a constant influx of visitors trying to walk along the King’s Road! 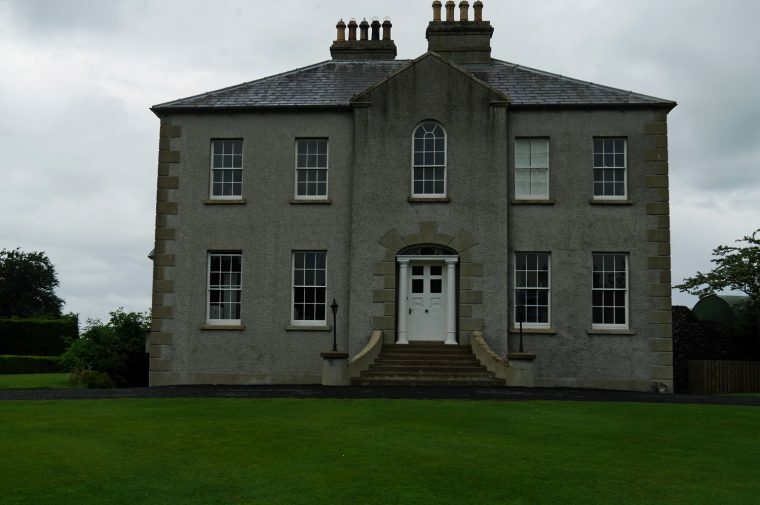 At the end of the avenue, Gracehill House was built around 1775 by James Stuart and named it after his wife, Grace Lynd. 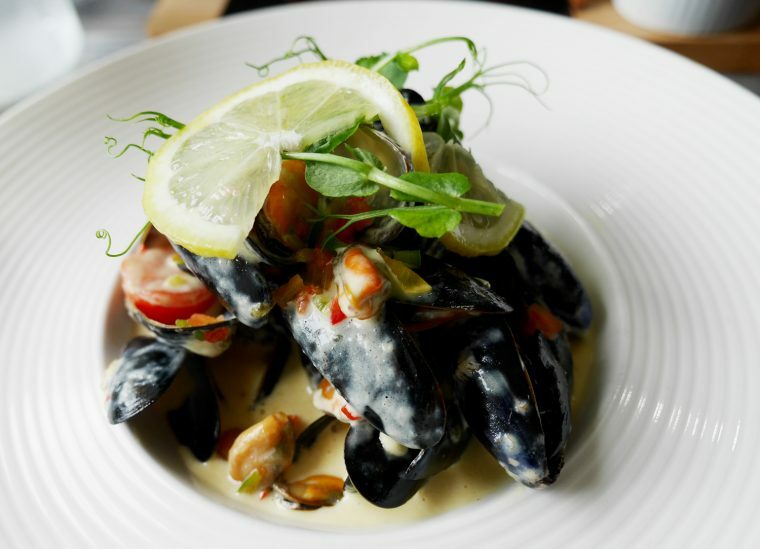 It’s a stunning building that houses a golf course and restaurant and is in the middle of refurbishment to create what looks as if it will be a wonderful hotel and spa. 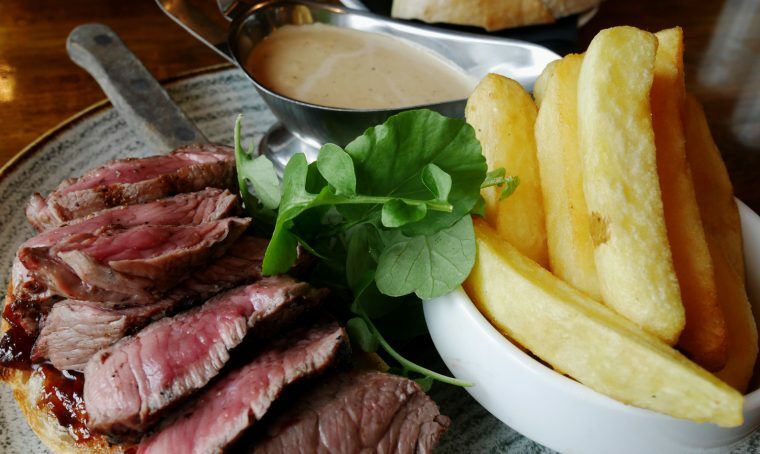 We very much enjoyed our lunch at the restaurant there though I’d recommend visiting for an evening meal when there’s a more extensive menu. 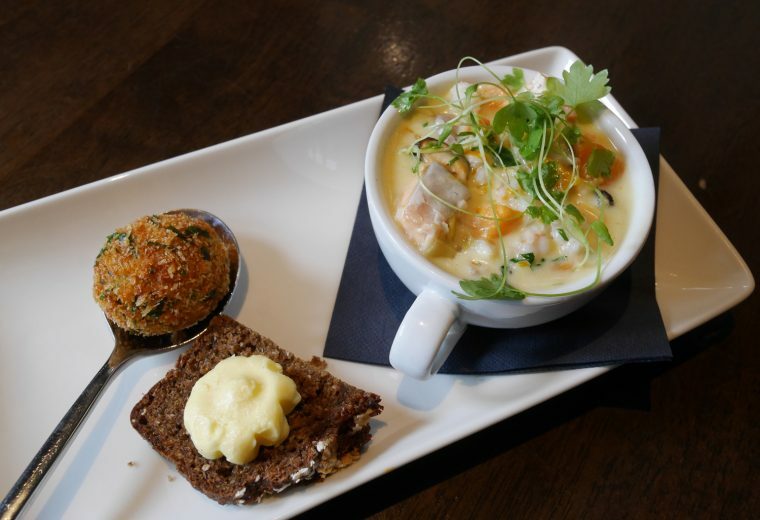 Head Chef Derek Steele at Gracehill told us that he’d worked for many years at the River Restaurant at Galgorm, alongside Chris Bell, who is now at the Eagle, the bar and restaurant at nearby Galgorm Castle. We both loved our lunch and enjoyed learning more about the development plans for Gracehill House. 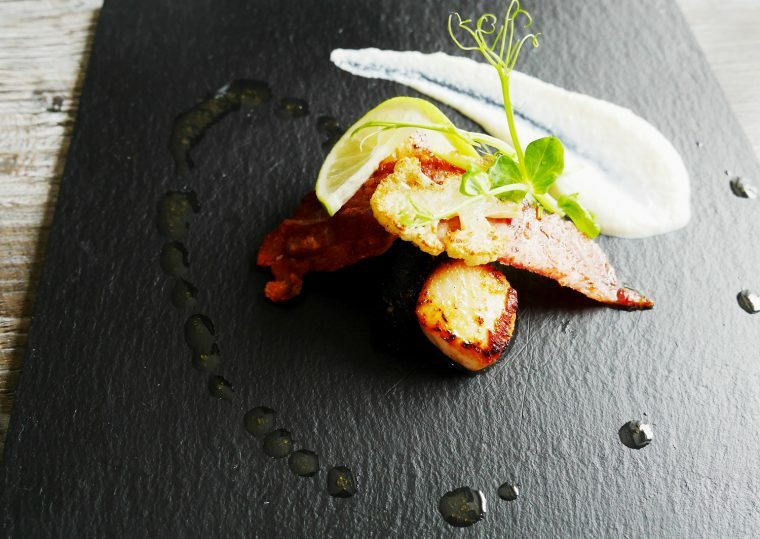 I particularly enjoyed my scallops with cauliflower, bacon and apple and the large bowl of local mussels. 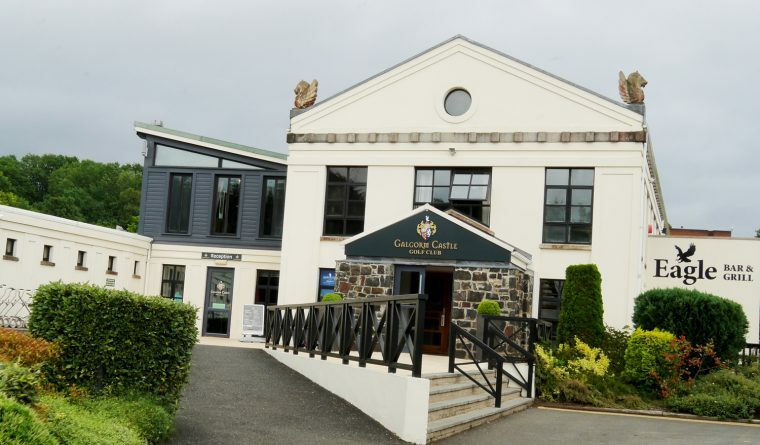 Already well behind on our itinerary, we didn’t manage to get to Belfast at all on the last day – our tour of Galgorm Spa and Hotel where we were staying took a couple of hours but was something neither of us would have wanted to miss as the range of accommodation was truly impressive. Instead, we decided to take ourselves to nearby Galgorm Castle Golf Club, where the Eagle bar and restaurant as mentioned earlier, is run by Chris Bell, the former Northern Ireland Chef of the Year who was also responsible, as executive chef at the River Restaurant, for achieving three AA rosettes. 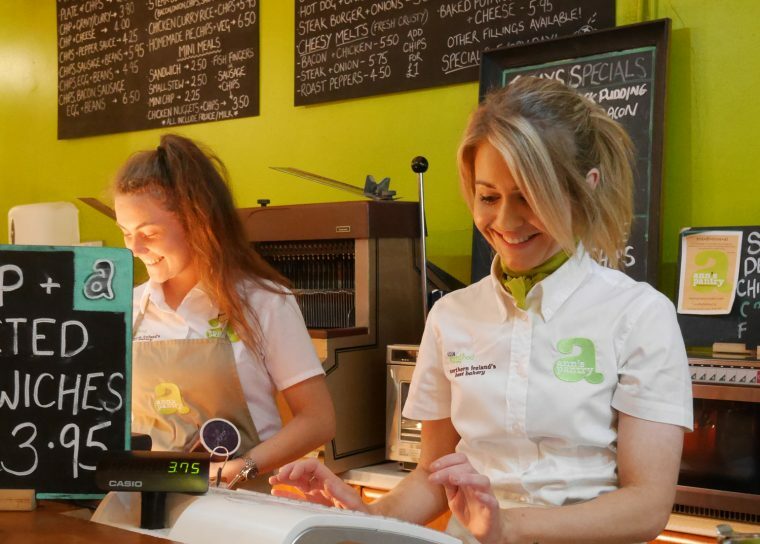 The informal golf club bar and restaurant was the perfect place to enjoy a good grass fed Irish beef club sandwich, which was truly delicious. But then, I’d spent the last three days eating so well I would have been disappointed with anything less than perfect. 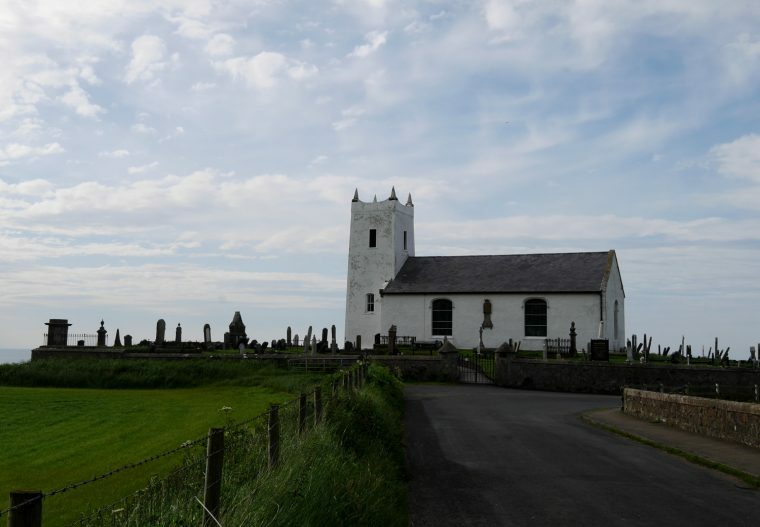 Our excursion and road trip around Northern Ireland was remarkably painless. Roads in Ireland are easy to navigate and the traffic levels are reasonable. And, things are just never that far away. We didn’t get lost, thanks to May’s remarkable navigation skills. And, we enjoyed wonderful food and saw some fantastic sights. 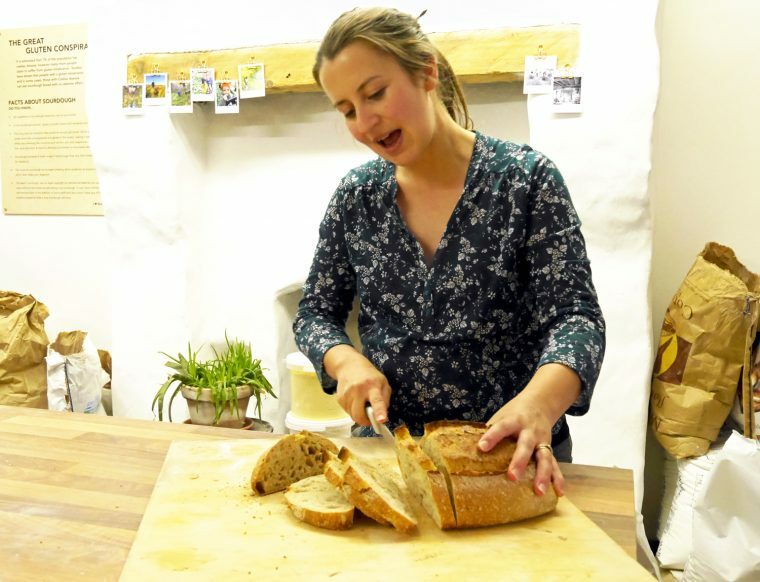 A walking tour while indulging on food is one of my favorites! I can really really sense that you enjoyed the food as much as the beautiful scenery! You cracked me up with your opening, btw! Haha! What a pity you couldn’t cross the Rope Bridge, I know it is scary and you were secretly happy but I am sure when you go back you will try. Am I right? This was a nice road trip. First of all you had some amazing cuisine experiences. The natural landscapes are to say the least stunning . 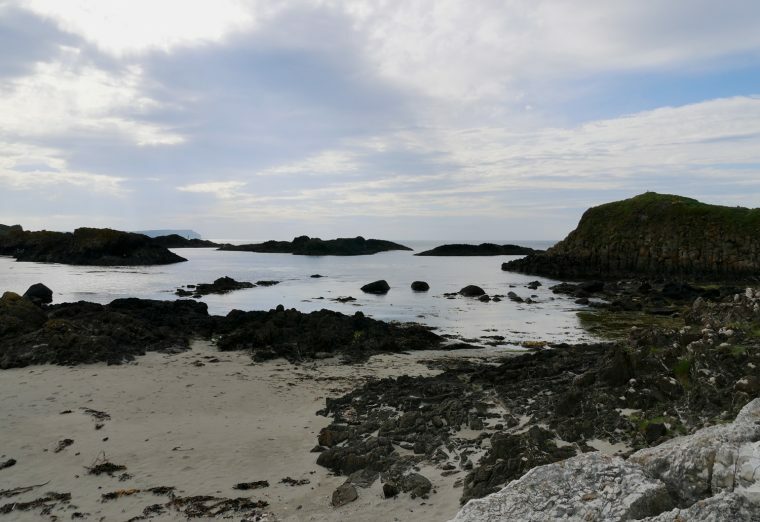 I especially fell in love with Ballintoy Village, it looks really enchanting and charming, straight out of a fairy tale. Quite the epic roadtrip, Carrick a Rede Rope Bridge really is a fine example of how stunning the countryside of Northern Ireland is – this was a highlight of our time – pity you didn’t have time to cross the bridge, though that said you definitely don’t get the same views when you’re actually part of the scenery! 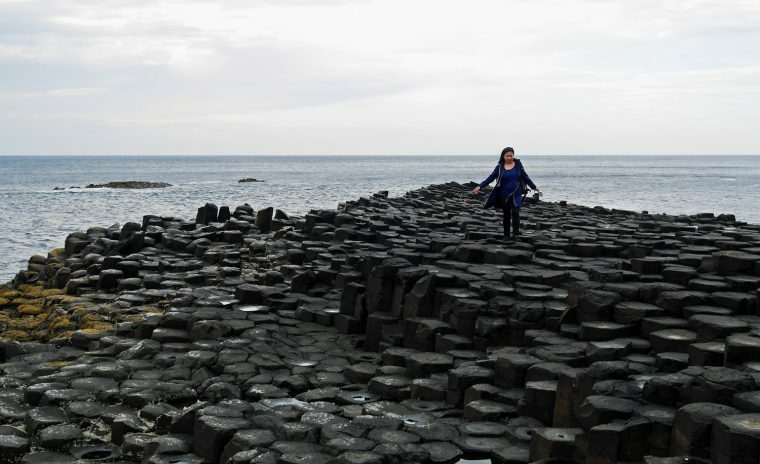 Giants Causeway was also an incredible trip. 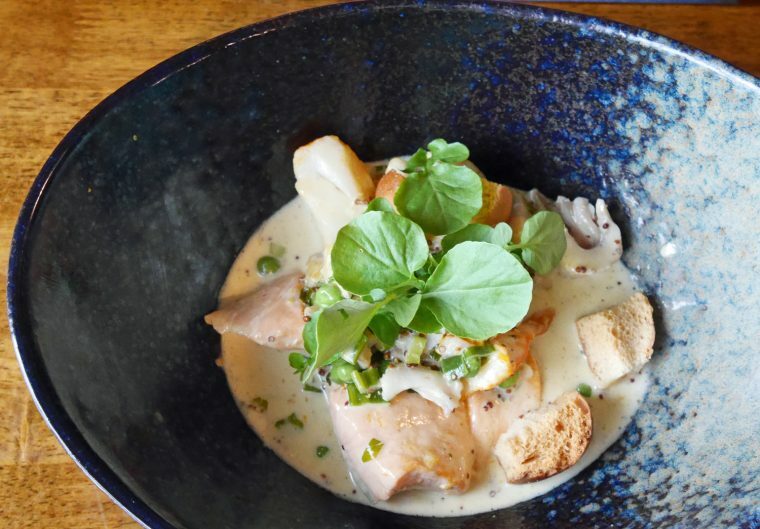 The food scene was fabulous. 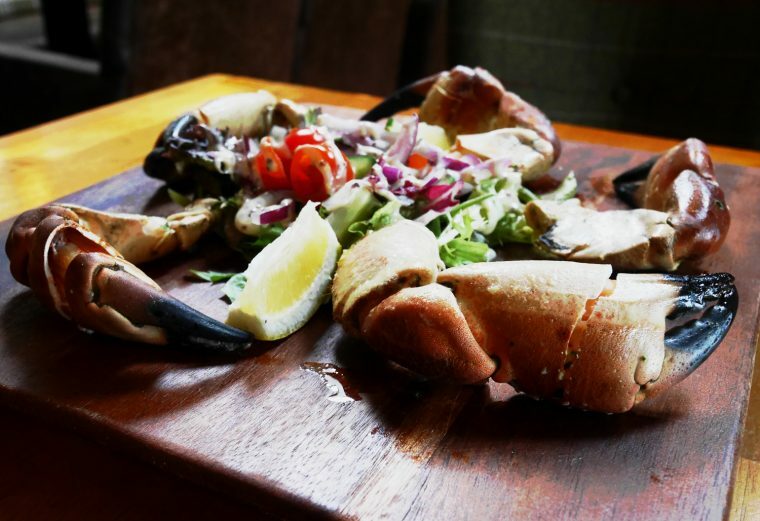 But then, I do generally enjoy some good grub! I’ve been to the Republic, but never Northern Ireland (apart from passing through), it looks lovely. I might have to incorporate it into our next trip over.